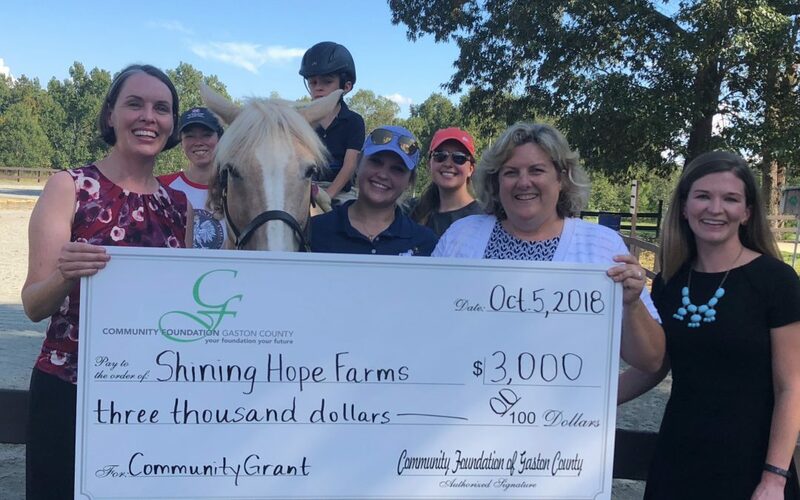 Mount Holly, NC (October 10, 2018) – Shining Hope Farms is pleased to announce it has received a $3,000 grant from the Community Foundation of Gaston County. The funds generously donated by the Community Foundation of Gaston County will be utilized to make very necessary improvements to the tack room and office at Shining Hope Farms’ Mt. Holly farm. The tack room is the farm’s most utilized space during the day as it is also the breakroom for staff and volunteers, and currently it is not climate controlled. To alleviate this issue, some of the funds will be used to purchase a PTAC Unit or packaged terminal air conditioner that can also be used to heat the space. This means that the staff and volunteers will now have a place of respite that they can go in between sessions and during lunch to cool off or get warm. It will also help to better preserve leather tack items. The funds will also be used to purchase a washer and dryer for the tack room, which will be very exciting for the staff and volunteers who have been without one for some years now. The washer and dryer is used to wash tack items such as saddle pads, horse blankets, and sheets. Finally, the remaining funds will be used to purchase weather resistant flooring in the tack room and office. The office flooring had previously suffered water damage and is in need of being replaced by something weather resistant. The tack room on the other hand, has never had flooring, and so the prospect of flooring is very exciting for staff and volunteers, as it will lessen dust. The Community Foundation awards annual grants through a competitive application and review process. “Shining Hope Farms provides therapeutic services that improve the quality of life for participants as well as their families The Community Foundation is pleased to award a grant to Shining Hope Farms so that necessary infrastructure improvements can be made to the tack room and office.” stated Ernest Sumner, CFGC President. Shining Hope Farms is a 501(c)(3) organization whose mission is to enable children and adults with disabilities to achieve functional goals through the use of equine assisted activities and Hippotherapy. Hippotherapy is a treatment strategy utilizing equine movement as part of an integrated intervention to achieve functional outcomes offered as part of Shining Hope Farms’ Therapy Services Program, which includes physical, occupational, and speech-language therapy treatment. Shining Hope Farms is the only facility offering this treatment strategy in the counties that they operate in. They are a Premier Accredited Center of PATH Intl. (Professional Association of Therapeutic Horsemanship, International) as well as the American Hippotherapy Association, and currently operate sites in Gaston, Mecklenburg, and Catawba Counties. There are 20+ horses, 2 miniature ponies, and 30+ staff members consisting of occupational and physical therapists, speech and language pathologists, PATH Intl. certified riding instructors, and administrative staff, plus many wonderful volunteers which make a well-rounded program. Shining Hope Farms is also a GuideStar Exchange Gold participant, a leading symbol of transparency and accountability among nonprofits. For more information, visit shininghopefarms.org. The Community Foundation of Gaston County is the leading steward of philanthropic giving by connecting donors with community needs to enhance the lives of present and future generations. The nonprofit organization has invested more than $100 million in grants and scholarships over its 40-year history. At its core, the Community Foundation is an organization created with gifts from generous people committed to local causes. For donors, the Foundation serves as a philanthropic advisor. For the community, the Foundation serves as a grant maker and a civic leader. Through the support of its donors and fundholders, the Foundation has been able to address some of the community’s most pressing needs, including hunger, housing and education. For more information, visit www.cfgaston.org.